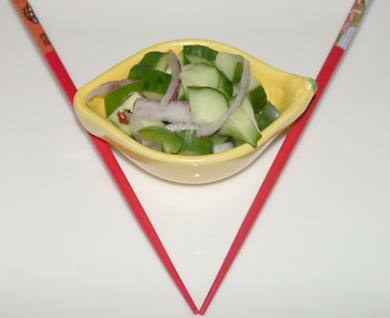 Recipe for Thai Style Cucumber Salad - a quick and easy salad great for accompanying Asian dishes. In a small saucepan, combine sugar, vinegar, water, crushed red pepper and salt. Heat over medium and heat and stir until sugar and salt dissolves. Put cucumber and onion in a small bowl, pour marinade over to cover the veggies, cover and chill for at least 30 minutes. The salad will keep for up to 3 days in the fridge, so make extra for later.